The convenient thing about FaceTiming is that your cellular minutes are not used – this gets even better for people on an unlimited data plan. But for people with limited data, we would advise that you turn off cellular for FaceTime – this would make FaceTime totally free (except for the cost of Wi-Fi). Here’s how much data FaceTime uses as well as how you can disable FaceTime from using your cellular plan data. Does FaceTime Use Wi-Fi Data or Cellular Data or Cellular Minutes? 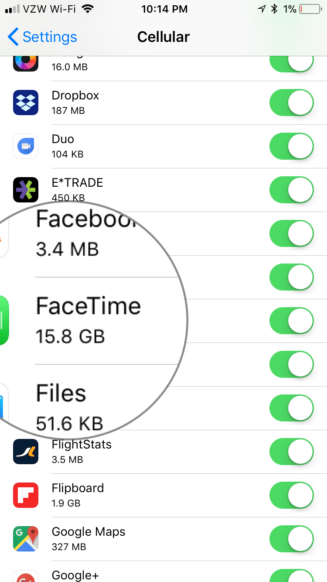 How Much Data Does FaceTime Use? Well, it depends. FaceTime is a free service that supports cross-platform Apple-to-Apple video and audio call making. As established earlier, FaceTime uses data, not minutes, and you can turn off FaceTime’s ability to use your cellular data if you wish. We will get to that further down in this post. In terms of general costs, FaceTime users only have to pay for their cellular plans and Wi-Fi. 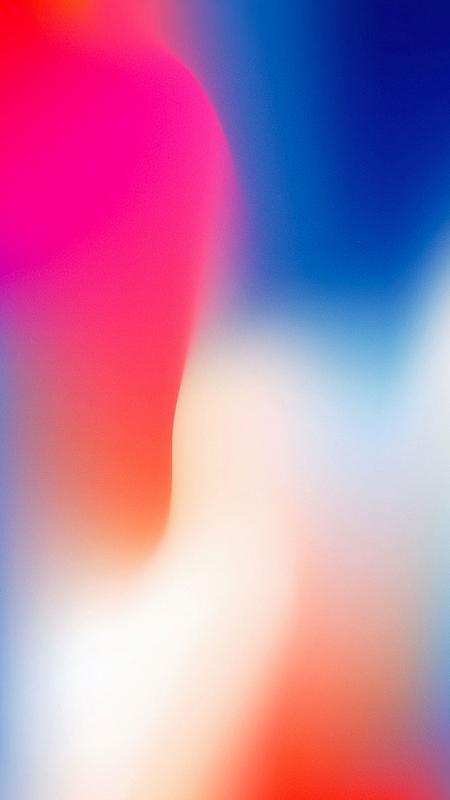 If you have a Wi-Fi connection, Facetime would default to your Wi-Fi but could supplement with your cellular data during low Wi-Fi signal assuming the Wi-Fi assist feature is turn on. By default Wi-Fi assist is enabled on iPhone 5 and later running iOS 9 and later. If you do not have Wi-Fi, FaceTime by default would use your cellular data, but will not use your minutes. You can turn FaceTime cellular data usage off completley, prohibiting cellular data to be used at all. If you turn on cellular data for Facetime, you are able to FaceTime without Wi-Fi. Based on our research, a 20 minute Facetime Video call consumes roughly 65MB of data. 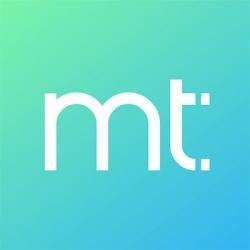 The usage appears linear as we’ve seen a short – 2 minute calls consume just over 6MB of data. For people who make short Facetime calls – 5 to 30 minutes, using FaceTime is not going to drain your data plan. Chances are that your idle time on social media and games will be responsible for more data usage. Facetime Audio calls consume less data than FaceTime Video calls but we expected the difference to be more significant. 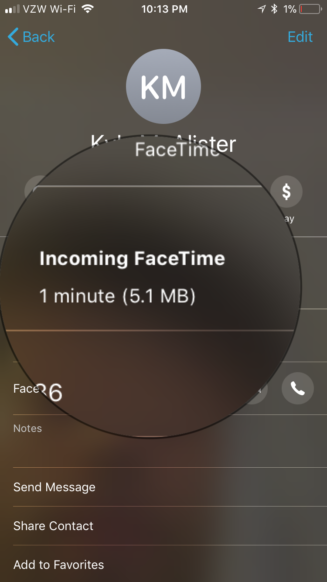 Even FaceTime Audio call consume over 2MB per minute. However, if you would be making longer FaceTime calls to maybe catch up with your distant family and friends, be sure that you are connected to Wi-Fi. Longer calls on FaceTime mean you use more data. 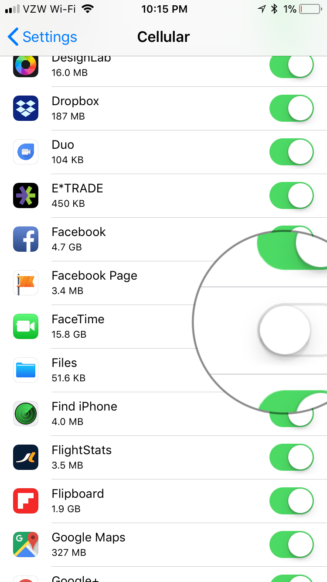 To ensure you don’t go on a data drain rampage, we would show you how you can track your FaceTime data usage as well as how you can disable FaceTime from using your cellular data. Open either the FaceTime app or your Phone or iPad. Tap “Recents” in the phone app. On the other hand, the Facetime app would automatically open your Facetime Video history. Click the ‘i’ next to the particular contact that you had a Facetime call with. If this call used your data, you would be able to see how much data was used next to the Facetime call’s timestamp. This process makes it easy to check if you are using too much data during a particular call. But if you want to keep a track on your overall FaceTime data consumption, then use this step. Find FaceTime by scrolling down. Below FaceTime, you would see the overall data usage. Keep in mind that your iPhone would not automatically reset your data usage. This means every time your plan is reset in a month or week, you have to manually reset the data usage as well to keep a track on your usage – otherwise, your overall data usage would be the data Facetime has used since you have had your iPhone. Open Settings, Click on Cellular. Scroll down and tap “Reset Statistics”. Doing this resets your data usage, so you can track it properly. Be sure to reset monthly for accurate tracking. Like any other Apple app, FaceTime’s ability to use your cellular data can be turned off. Doing this means all FaceTime calls would use your Wi-Fi connection and not your data. Scroll down till you find Facetime. In this case, the drawback is that if you’re not connected to a Wi-Fi network, you will not be able to make a FaceTime call. Now you know that FaceTime uses cellular or Wi-Fi data based on your situation and settings. You also know how to track the data usage on a per call basis and aggregate basis. And finally, you’ve learned how to stop FaceTime from using your cellular data if you wish. If you have any questions, leave a comment in the comments section below and we would be glad to answer them.